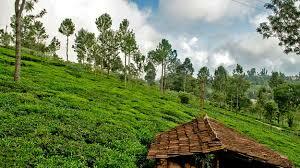 Also known as Kodagu, Coorg is a hill station located 240 km west of Bangalore. 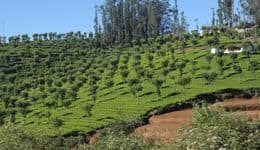 The hill station is famous for tea and coffee plantation. 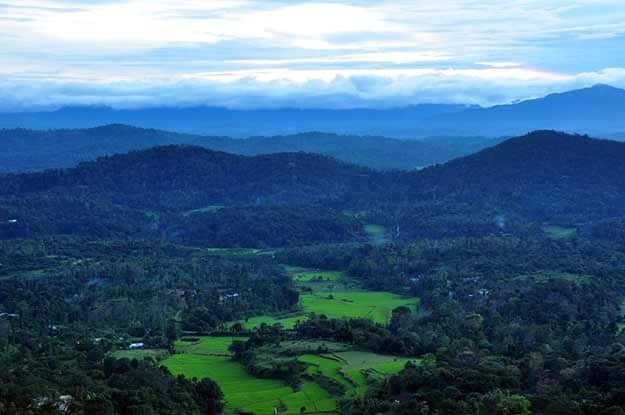 Coorg is also called the ‘Kashmir of South’ and ‘Scotland of India’ thanks to its cool climate and stunning landscape. Located at an elevation of 3500 ft amidst the lush greenery of the Western Ghats, Coorg will mesmerize you with its natural beauty. The mist covered hills, stream, lake and the sweet smell of coffee will make you forget about the stressful life of the city. The beautiful terrain of Coorg is ideal for hiking and trekking. For adventure enthusiasts, Coorg offers activities like paintball and dirt biking. Activities: You can go for treks and hiking if you are adventurous type. The peaceful Honnamana Kere Lake is another place you could visit. Boating in the lake surrounded by the thick vegetation will let you relax. You can also go for river rafting in Barapole River. The wide stretches of the river allows the raft to gain speed. White river rafting in the Barapole River is highly recommended. Best places to stay in Coorg: As the hill station is a very popular tourist destination it is advisable to book the rooms in advance. There are several budget hotels that would cost you about Rs 600 per day. Vedanta Wake Up - Madikeri Town Center (082722 29518) and Hotel Green Haven (082722 20666) are two of the budget hotels in Coorg. Kadkani River Resort (094808 33780), Coorg Jungle Camp Backwater Resort (094824 04040) and Amanvana Spa Resort (082762 79353) are some of the luxury hotels you could checkout. Best time to visit: Winter season is the best time to visit this place. You can visit Coorg between October and May. Tips: Coorg is popular for home-made wines. Do try the wine along with Coorg pork curry, Kadumbuttu and the bamboo shoot curry. Located 151.6 km south of Bangalore at the base of the Chamundi Hills, Mysore is called as the city of palaces. The beautiful monuments and the rich history of this place make it one of the most popular tourist destinations. The city is also the hub of sandalwood, incense and silk production. Many tourists visit Mysore to learn Ashtanga Yoga, which is practice across the city. From 1399 to 1947, Mysore was the capital of Kingdom of Mysore and was ruled by the Wodeyar dynasty. In the late 18th century, for a short period, Mysore was ruled by Hyder Ali and Tipu Sultan. The Wodeyars contributed immensely to the growth of the city’s culture. 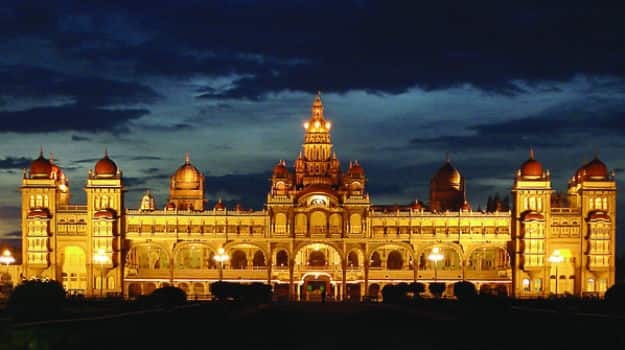 Mysore is known for Dussera celebration and it palace, the Mysore Palace. Tourists flock to the city during Dussera festival to see the colorful procession. Mysore was the location of India’s first private radio station. Things to do: You should start exploring the city with the Mysore Palace. The rich history and beautiful architecture of the monument are something you must not miss. The palace has a fusion of Indo-Saracenic architecture. The paintings, spacious halls and the beautiful pillar will take you back in time. The palace is lit up during festivals and on Sundays. Dassera is another time for the year when you should visit Mysore. Mysore palace is lit up for the occasion. The Wodeyars’ family goddess is Chamundi and the idol of the goddess is taken out for in an elaborate procession involving elephants, horses and dancers. The Brindavan Gardens is another place you must visit in Mysore. The musical fountain of the garden is famous among tourists. The Railway Museum of Mysore is an interesting place that gives you a glimpse of India’s rich history of railways. Best places to stay in Mysore: Hotel Kanishka (0821 466 6688), Hotel Shastri Paradise ( 0821 425 2134), Hotel MB International (096206 72223), Hotel BS International (095911 17445) and Hotel Sujatha Residency (0821 249 6999) are some of the best hotels in Mysore. Best time to visit: The period between September and March is the best time to visit Mysore. Tips: Make sure you taste Mysore Pak, a sweet dish that melts in your mouth. Things to do: Located in the south-east part of the town, Kodanda Ramaswamy Temple has Hoysala architecture. The temple has three parts. The Navagraha shrine of the temple was in the 14th century AD, while the entrance was constructed in 17th century and the Mukhamanatapa in the 16th century. The temple’s annual festival, which is known as “Jatra”, is held in the month of February and it attracts devotees from across the state. Mahatma Gandhi Park of Chikmagalur, also known as Rathnagiri Bore, is located in the northern part of Chikmagalur. The park has an amphitheater with 2509 types of rose plants. Many cultural and musical events are organized at the amphitheater. The park also has a toy train and a greenhouse with around 300 species of flowering plant. Chikmagalur is also home to the famous Bhadra wildlife sanctuary, which is also a tiger reserve. The sanctuary is a popular site for day oiutings. Approximately 33 tigers are there in the reserve. Youu can also spot elephants, leopards, sambhars, wild boars, chital etc here. The sanctuary also has many varieties of flora. Bhadra wildlife sanctuary is open on all days from 6:30 am to 8:30 am and from 4pm to 6pm. You can carry camera inside the sanctuary for a small price of Rs 150. For vehicles, the charges are Rs 350. Best places to stay in Chikmagalur: Chikmagalur offers different types of accommodation options. Some of the best hotels in Chikmagalur include The Planters Court (082622 35881), Crystal Inn (093686 58225) and The Gateway Hotel Chikmagalur (082626 60660). Best time to visit: September to May is the best time to visit Chikmagalur. Tips: Take a trip to the coffee plantations and sip fresh coffee straight from the garden. Located on the bank of Yagachi River in the district of Hassan, Belur is famous for the Chennakesava temple, which is one of the best examples of Hoysala architecture. Belur, along with Halebeedu, was once the capital of Shravanabelagola and Hoysalas. Belur became the capital after the Delhi Sultanate invede the place. Belur has rich history and beautiful heritage structures. Apart from Chennakesava temple, there are several temples in Belure like Veera Narayana temple and Kappe Chennigaraya temple. Belur’s temples give you a peek into the exquisite Hoysala craftsmanship and architecture style. Things to do: Chennakesava temple is the first thing you must see when you land in Belur. Dedicated to Vishnu (Chennakesava), the Chennakesava temple was constructed to mark King Vishnuvardhana’s victory over Cholas in 1117. Some believe that the construction of the temple was completed in 103 years. 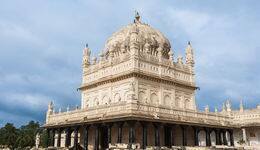 The construction was completed by the grandson of Vishnuvardhana, Veera Ballal II. Scenes from Ramayana, Upanishadas and Mahabharata have been carved on the temple walls. The temple is adorned with sculpture of animals and birds. The Chennakeshava temple complex is surrounded by the Kappe Chennigraya temple, which was built by king Vishnuvardhana’s queen, Shantaladevi. According to legends, the poses of the sculpture is inspired by Shantaladevi and her dance. The Pushkarni or the step well is another attraction of the temple. The step well is located to the right side of the temple’s main entrance. The rayagopuram at the entrance was added later and has Dravidian style. Another popular feature of the temple is the Darpan Sundari, a sculpture of a lady with a mirror. The craftsmanship and the beauty of this sculpture are unmatched. Green soapstone has been used to build the temple, which has intricate detailed carvings. The temple also has sculpture made using sandalwood and ivory. Known for temples, Halebeedu is located in the Hassan district. This small town, along with Shravanabelagola and Belur, forms Karnataka tourism’s golden triangle. Your trip to Belur is incomplete without a visit to Halebeedu. 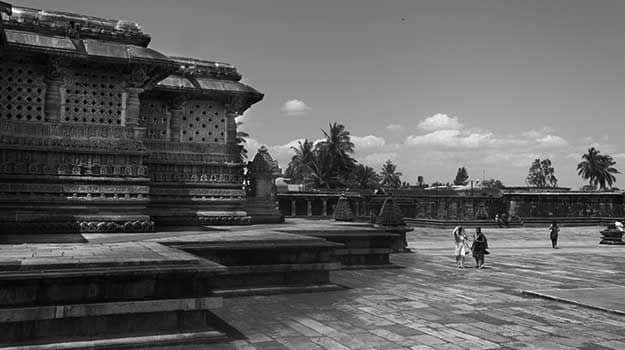 Halebeedu is the twin town of Belur. Halebeedu, whcibh means ruined city, was once called Dwarasamudra, which meant entrance to the ocean. Many tempels were built in the 12 th century, when Halebeedu was the capital city of the Hoysala Empire. The empire started to fall after it was invaded by the Delhi sultanate. Kedareshwara temple and Hoysaleswara temple are the two main temples of Halebeedu. These temples were constyructed using soapstone. The Hoysaleswara temple has two monolith Nandi images on the sides. The temple complex also includes an archeological museum. Kedareshwar temple is famous for its magnificently carved Hoysalaemblems. The temple was constructed in 1319 and attracts devotees of Vishnu and Shiva from across the state. The temple has shrines for the idol of Janardhan, Brahmalinga and Shivlinga. Best places to stay in Belur: Hotel Mayura Velapuri Belur (089706 50026), Vishnu Regency ( 090609 82495) and Karnataka Hotels Belur (KSTDC) are some of the hotels you could checkout for accommodation. Best time to visit: October to April is the best time to visit Belur. Located near Mysore, Srirangapatna is a town in Mandya District. Srirangapatna has a rich history. 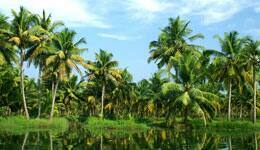 The town, which is located on an island in the River Kaveri, was the capital of Tipu Sultan’s Khudadad State. Srirangapatna is also an important Vaishnavite centre. The name of the town is derived from the Ranganathaswamy temple dedicated to a manifestation of Vishnu, Ranganatha. According to legend, Buddha stayed in one of the island near Srirangapatna. During the Vijayanagar Empire, Srirangapatna was the seat of the viceroys. The Srirangapatna fort remained the seat of the Mysore rulers even after independence was declared by the Wodeyars of Mysore. The fort stayed the seat of power when Tipu Sultan became king. 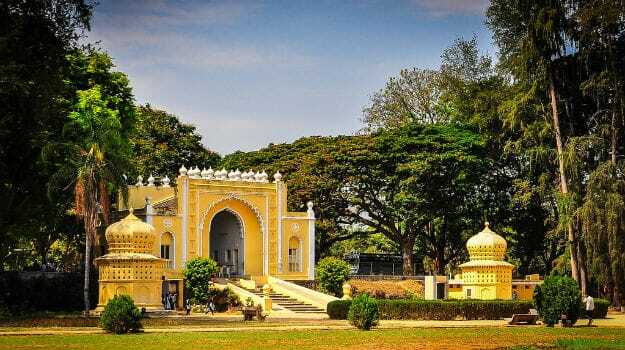 In the 18th century, the Marathas attacked the town of Srirangapatna when it was used as the capital by Hyder Ali. The town was also the scene for the historic battle of Seringapatam. The battle was the last fought between Tipu Sultan and the British. Tipu Sultan was killed during the battle and today, a memorial stands at the spot where his body fell. Things to do: Ranganathaswamy temple is one of the three temples constructed on three islands of Kaveri. The temple was built by the Ganga Dynasty in the 9th century. The temple is dedicated to Ranganatha, a manifestation of Vishnu. The temple has fusion of the Vijayanagar and Hoysala style of architecture. Gumbaz in Srirangapatna is another tourist attraction. The gumbaz houses the tombs of Tipu Sultan, his mother Fatima Begum and his father Hyder Ali. Tipu Sultan’ tomb is situated on an elevated platform. The tombs of other relatives situated surrounding the tomb of Tipu Sultan. The tomb is surrounded by a beautiful garden. The Gumbaz also has a mosque next to it. You can visit the Gumbaz between 8am and 6pm. Daria Daulat Bagh and Museum houses things related to Tipu Sultan. The exhibits include paintings, coins, costumes, pencil sketches, furniture and ammunitions. The oil painting, ‘The storming of Seringapatam’, by Sir Robert Ker Porter is one of the exhibits. Srirangapatna fort is also called Tipu’s Palace. It is one of the popular tourist attractions in India. The fort includes ‘Lal Mahal’ which was the former residence of Tipu Sultan. The fort is constructed using massive granite bricks. Rubble and mud is used for the interiors of the fort. Best time to visit: September to March is an ideal time to visit Srirangapatna. 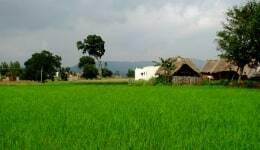 Located at an elevation of 3113 feet, Sakleshpur is a hill station in Hassan district, Karnataka. The hill station is hidden away from the noise and pollution of the city life. 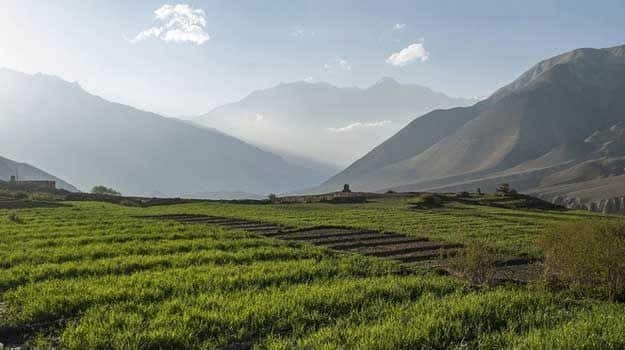 With the lazy streams, meadows, clean air, mountains covered in mist and velvety grassland, this hill station is the perfect destination to unwind and relax. Located amidst Western Ghats, Sakleshpur is famous among trekkers. You can walk through tunnels, trek to beautiful Ombattu Gudda peak or enjoy the Hadlu waterfall. You can also visit the coffee estate, Raxidi Estate, which covers about 1000 acre land. The rolling hills covered in coffee plantation are a sight to behold. It also has pepper and cardamom plantation. The hills covered in mist add to the charm of the place. Things to do: Trekking through the beautiful landscape of Sakleshpur is a must-do. One of the famous routes for trekking is Bisile ghat or Bisile reserve forest in Sakaleshapura taluk. Kumar Parvat is among the challenging hikes of the region. 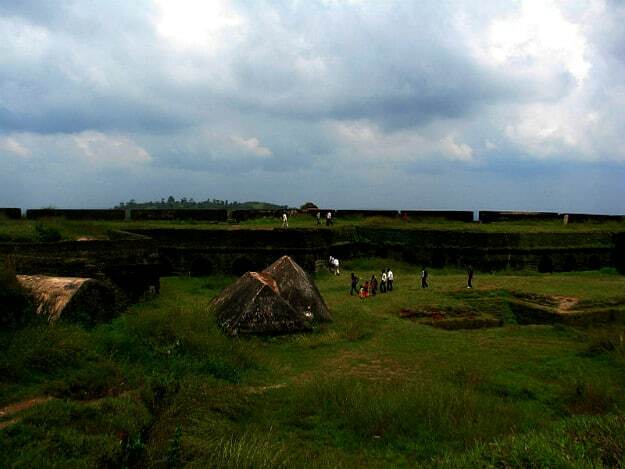 Another hidden gen is the Manjarabad fort, which is located on National Highway 48, just outside Sakaleshapura. It is constructed by Tipu Sultan as a strategic defensive location. The fort was constructed in 1792. It is believed that a passage has also been constructed by Tipu Sultan from this fort to another fort located in Sriranagapatna. The fort is situated on a hill at a height of 3,241 ft and gives a sweeping view of the surroundings. The Arabian Sea is also visibile from the fort on a clear day. Sakleshpur has a temple at the entrance of the town. The temple has a lingam which is called Sakaleshwara. The ratha yatra of Sakaleshwara swami that is held every year in February on Purnima is famous. Another temple has been constructed in this town called Holemalleshvara. The temple dedicated to Shiva is located at the bank of River Hemavathi. The temple gets filled up with water of the river during the rainy season. 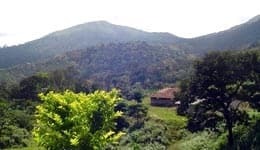 Best places to stay in Sakleshpur: There are several homestays in Sakleshpur where you can taste the unique culture of this place. These include Nyrit Villa Homestay, Hale Mane Homestay (094822 24201) and Misty Mountains Homestay (090082 97997). Best time to visit: You can visit Sakleshpur between October and March. Away from the concrete jungle, Ramanagara offers you a landscape with open space and hills. Ramanagara has seven major hills, namely Jalasiddeshawara Betta, Sidilakallu Betta, Krishnagiri, Revannasiddeshwara Betta, Somagiri, Shivaramagiri and Yatirajagiri. The hilly terrain of the place is apt for trekking and hiking. The city is also known as the silk city in Karnataka. This is one place where you should shop for silk saris. The picturesque locale of Ramanagara was pulled to limelight after the legendary movie Sholay was shot here. David Lean’s film, “A Passage to India” was also shot here. Ramanagara is located around 50 km south-west of Bangalore and was earlier called as Closepet. Things to do: Visit Janapada Loka to understand the rural folk culture. The organization preserves and propogates Karnataka’s folk culture. It includes museum, open-air theater and an art gallery. Mekedaatu or Goat’s leap is another place you must visit. Mekedaatu is a popular picnic spot located where Arkavathi River and Kaveri River merge. You will be welcomed by the sound of gushing river and chirping birds. Built in 1846, Kanva Reservoir is located across the river Kanva. The reservoir is an idela picnic spot. You can camp her and indulge in fishing or bird watching. Best places to stay in Ramanagara: Checkout Hotel Mayura Sangama Mekedatu and Hill View Resorts (097409 83701) for accommodation. Best time to visit: Winter is the best time to visit Ramanagara. Monsoon is also a good time to visit but not if you are interested in rock climbing. 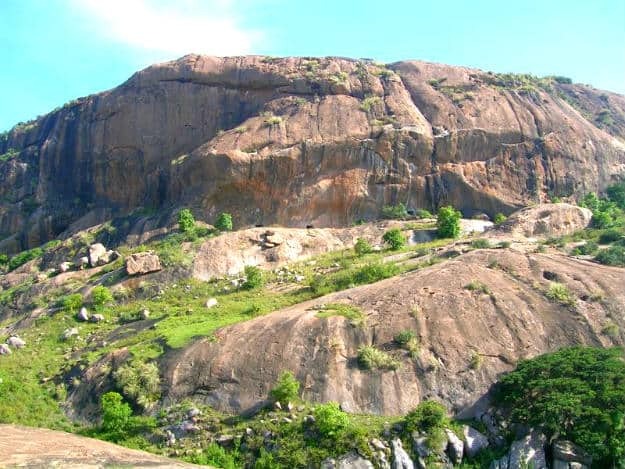 Tip: Do visit the Ramanagara to relive the scenes from the iconic movie Sholay. Located in Tamil Nadu,Yelagiri is called as the Poor Man’s Ooty. The hill station, which is located at an elevation of 4,626 ft in Vellore district, is a famous trekking destination. Surrounded by rose gardens, orchards and lush green valleys, Yelagiri is one of the most beautiful hill stations in South India. The hill station has 14 hamlets. The roads to this scenic hill station have several hairpin roads offering the breathtaking view of the hills and slopes. Yelagiri is not as commercialized as other famous hill stations and the government has undertaken many steps to promote this place. The place offers many adventure sports like rock climbing, trekking and paragliding. Once the property of the zamindars of Yelagiri, the land was taken over in 1950s by the government. The hills station is has pleasant climate throughout the year. Things to do: Swamimalai Hills is one of the places you must visit. The place offers one of most scenic treks in the region. The trek is not difficult and the view from the top of the hill is worth the climb. The artificial Punganur lake is one of the places in Yelagiri you must visit if you are a boating enthusiast. The lake also has a garden called the ‘Mughal Garden’. You can enjoy a lazy boat ride in the lake. The nature park located in Yelagiri is home to several varites of plants. Spread across 12 acres of land, the park is an ideal place to relax and unwind. The lush green landscape, artificial waterfalls and musical fountains will keep you entertained. The park also has a bamboo house, fish aquarium and many more features. Best places to stay in Yelagiri: Some of the best hotels ion Yelagiri include Yelagiri - MariGold Ridge (096551 67374), Chariot Valley Yelagiri, Kumararraja Palace Yelagiri (04179 245 325), Touchstone Resort (096008 99998) and Hotel Landmark (04179 245 335). Best time to visit: October to February is the best time to visit Yelagiri. Located in the Chikkaballapur dirstric, Nandi Hills is an ancient hill fortress. The hills are located about 60km north of Bangalore. It is believed that the Arkavathy River has originated from the hills. The hills are called Nandi Hills probably because it looks similar to a sleeping bull or Nandi. The hilsl were called Ananda Giri during the Chola period. The Nandi fort or Nandidurg, which was constructed by Tipu Sultan, was another reason for the name of the hill. According to another legend, the hill derived the name from an ancient temple located on top of the hill. The Nandi temple is about 1300 years old. There is another temple on this hill dedicated to Parvati and Shiva. The Nandi Hills offer a stunning view of the entire city. The cliff of the hill also has a past. It is said that the prisoners were pushed down the cliff as a punishment and the scream of each prisoner is represented by the rustling of leaves. The cliff is known as Tipu’s Drop. Nandi Hills is also a place where you go cycling. The tantalizing altitude and the beautiful landscape make it the most delightful biking or cycling experience. 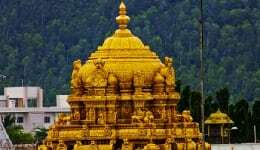 Things to do: Someshwara swami temple or Bhoganandeeshwara temple, located at the foot of Nandi Hills, is one of the oldest temples in the state. Built out of rock, the temple has two complexes with three deities in one and a huge Kalyani pond in the other. The Banas of ninth century built the foundation of Bhoganandeeshwara temple. The roof was constructed by the Cholas and the marriage hall was constructed by the Hoysala during the thirteenth century. The carvings on stone of the temple attract lot of tourists and art students. The Vijayanagar kings constructed the second complex. Tipu’s summer palace is another tourist attraction. Although, Haider Ail initiated the construction of the palace, it was Tipu Sultan who completed it. The palace was used by Tipu Sultan as his summer resort. The palace was called the Tashk-e-jannat by Tipu Sultan. It is built using mainly wood with intricate carvings. The pillars, ceilings and the painted wall give you a glimpse of the grandeur fo the bygone era. Another interesting place you could visit near Nandi Hills is the Grover Zampa Vineyards. Famous for their iconic La Réserve red wine, the vineyard is one of the oldest wineries in India. La Réserve is a blend of Shiraz and Cabernet Sauvignon. Grover Zampa Vineyards offer guided wine tours and the entire wine making process is explained in may man’s terms. The barrel room is where wine tasting is conducted. This is also the room where the premium wines are kept for aging. To soak in the smell of wine combined with the smell of oak is a wonderful experience. A total of five wines are offered for tasting. They organizers of the tour also inform the visitors about food and wine pairing. The wine tour lasts for around three hours and ends with a lunch. You can also purchase wine here at subsidized prices. 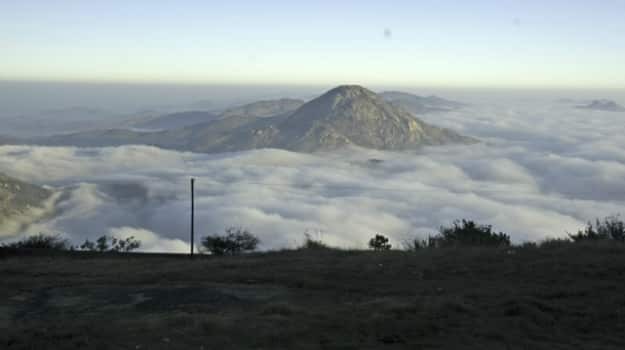 Best time to visit: Nandi Hills has pleasant temperature all around the year. You can visit the hill at any time and enjoy the mesmerizing view. Tips: Do visit the vineyard for an interesting day sipping wine and learning about the peocess of making wine.